EBC Orangestuff Front Brake Pads 05-18 Dodge Ram V6, V8 EBC Orangestuff Front Brake Pads 05-18 Dodge Ram V6, EBC Orangestuff Front Brake Pads 05-18 Dodge Ram V8, Orangestuff Front Brake Pads 05-18 Dodge Ram V6, Orangestuff Front Brake Pads 05-18 Dodge Ram V8, Front Brake Pads 05-18 Dodge Ram V6, Front Brakes, [EBC Brakes ED91738 Brake Pads] - $199.95 : 3rd Strike Performance, Your Source for Late Model MOPAR Performance Parts and Accessories! EBC Yellowstuff 4000 Series pads are the perfect replacements for your daily-driven race car or ultra-friction truck upgrade. They're made from a full race material and are capable of high-temperature use, with a very good wear life. Their "bite" from cold is superb—uncommon with race materials, which normally require warming-up—making these pads safe for use on the highway, as well as on the race track. EBC pads deliver increased stopping power for your performance race machine and your demanding truck or SUV. 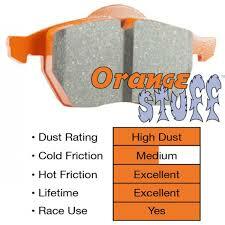 These are not "low-dust" disc brake pads, but are similar to or better than OE pads.